High quality precision anodized aluminium spinner-prop adapter combination. For 5.0mm motor shaft. Color may vary from photo. High quality precision anodized aluminum 32mm spinner-prop adapter combination. For 2.0mm(0.079") motor shaft. Color may vary from photo. High quality precision anodized aluminium 32mm spinner-prop adapter combination. For 3.0mm(0.118") motor shaft. Color may vary from photo. High quality precision anodized aluminium 32mm spinner-prop adapter combination. For 3.2mm(0.125") motor shaft. Color may vary from photo. Replacement assembly, use to repair damaged setup or to change shaft sizes. High quality precision anodized aluminium spinner-prop adapter combination. For 3.0mm(0.118") motor shaft. Color may vary from photo. GF Nylon Spinners have light weight aluminum back plate. No special prop nut or adapter is required. Spinner is held to back plate with two attachment screws. Machined groove supports edge of spinner. Back plate is knurled on both sides to grip both your prop and prop adapter making it easier to tighten than other spinners of this style. Size 1.5" (38mm) OD. Factory shaft hole in back plate is .197" (5mm). 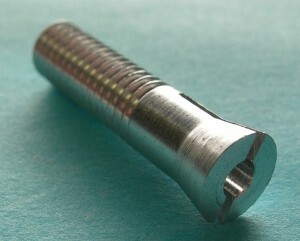 Overall Length is 1.4" (35.5mm). See this and all other new sizes up to 75mm in Spinners-Fixed-Props. Within "E-Power-Everything". High quality precision anodized aluminium spinner-prop adapter combination. For 3.2mm(1/8") motor shaft. Color may vary from photo. High quality precision anodized aluminium spinner-prop adapter combination. For 4.0mm motor shaft. Note: Color is Silver, photo depicts red, new photo pending. High quality precision anodized aluminium spinner-prop adapter combination. For 5.0mm motor shaft. High quality precision anodized aluminum 48mm spinner-prop adapter combination. For 4.0mm(0.016") motor shaft. High quality precision anodized aluminum 48mm spinner-prop adapter combination. For 5.0mm(0.20") motor shaft. Light weight design made of high quality aluminum bar stock. Polished to mirror finish. Comes with 2.3, 3.2 and 4mm collets. Allows use of Maxx Products (MPI) PS26 & PSR29 spinner with 2mm motor shaft. Allows use of Maxx Products (MPI) PS29 & PSR29 spinner with 2.3mm motor shaft. Allows use of Maxx Products (MPI) PS26 & PSR29 spinner with 3mm motor shaft. Allows use of Maxx Products (MPI) PS29 & PSR29 spinner with 1/8" - 3.17mm - 3.2mm motor shaft. Allows use of Maxx Products (MPI) PS29 & PSR29 spinner with 4mm - 3.2mm motor shaft. GF Nylon Spinners have light weight aluminum back plate. No special prop nut or adapter is required. Spinner is held to back plate with two attachment screws. Machined groove supports edge of spinner. Back plate is knurled on both sides to grip both your prop and prop adapter making it easier to tighten than other spinners of this style. Size 1.75" (45mm) OD. Factory shaft hole in back plate is .197" (5mm). 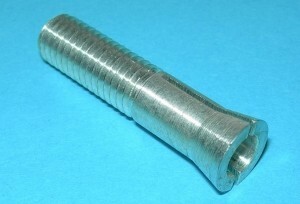 Overall Length is 1.8" (45.7mm). See this and all other new sizes up to 75mm in Spinners-Fixed-Props. Within "E-Power-Everything". Light weight design made of high quality aluminum bar stock. Polished to mirror finish. Comes with 3.2 (1/8"), 4mm, and 5mm collets. Light weight design made of high quality aluminum bar stock. Polished to mirror finish. Comes with 3.2 (1/8"), 4mm, and 5mm collets. Reverse Pitch Version. Allows use of Maxx Products (MPI) PS38 & PSR38 spinner with 3mm motor shaft. Light weight design made of high quality aluminum bar stock. Polished to mirror finish. Comes with 4 and 5mm collets. Allows use of Maxx Products (MPI) PS44 spinner with 3mm motor shaft. Allows use of Maxx Products (MPI) PS44 spinner with 6mm motor shaft. Allows use of Maxx Products (MPI) PS50 spinner with 3mm motor shaft. Allows use of Maxx Products (MPI) PS50 spinner with 6mm motor shaft. 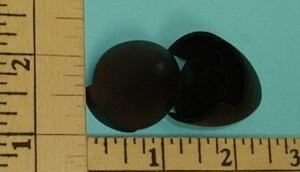 Replacement rubber spinner for GWS Electric Power Systems. Press fits over 6" to 12" props onto your 3.0mm diameter drive shaft. 1 per package. All the IPS, EPS100,280,300,370 drive systems have 3mm shafts as do many aftermarket gearbox's for 280-300 class motors as well as most gear drives for 20mm inrunners. This item is 1 spinner, 2 shown in photo for clairity. GWS suggests for 13" and larger props, could be used on smaller props also. Main thing is this spinner has a larger OD and if it give the look your going for then it's the right spinner. Presses onto 3mm shaft over prop. 30mm OD. Two shown for clairity, 1 spinner included in this item. GF Nylon Spinners have light weight aluminum back plate. No special prop nut or adapter is required. Spinner is held to back plate with two attachment screws. Machined groove supports edge of spinner. Back plate is knurled on both sides to grip both your prop and prop adapter making it easier to tighten than other spinners of this style. Size 2.25" (57mm) OD. Factory shaft hole in back plate is .252" (6.4mm). Overall Length is 2.265" (57.5mm). Presses on 1.5mm motor shafts, skirts of spinner reach around prop for nice spinner look. Could be useful to Sukhoi or any other setup with shaft sticking through prop after prop is mounted. This spinner does not adapt any prop to a shaft and is purely cosmetic/safety type spinner. GWS lists it as being useful for 2.5"-3" props but it is usefull up to 5" with our internal collets as the mounting method on the 4mm bore HD props. Holes size in spinner is 1.3mm so it will press nicely on 1.5mm shafts. The spru includes 4 spinners. Light weight design made of high quality aluminum bar stock. Polished to mirror finish. Comes with 4 and 5mm collets. Reverse Pitch Version. Cut for reverse (counter rotating or pusher) prop. Light weight design made of high quality aluminum bar stock. Polished to mirror finish. Comes with 2.3, 3.2 and 4mm collets. GF Nylon Spinners have light weight aluminum back plate. No special prop nut or adapter is required. Spinner is held to back plate with two attachment screws. Machined groove supports edge of spinner. Back plate is knurled on both sides to grip both your prop and prop adapter making it easier to tighten than other spinners of this style. Size 2" (51mm) OD. Factory shaft hole in back plate is .248" (6.22mm). Overall Length is 2.032" (51.6mm). GF Nylon Spinners have light weight aluminum back plate. No special prop nut or adapter is required. 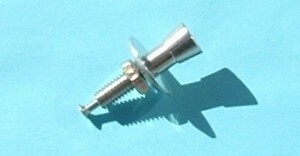 Spinner is held to back plate with two attachment screws. Machined groove supports edge of spinner. Back plate is knurled on both sides to grip both your prop and prop adapter making it easier to tighten than other spinners of this style. 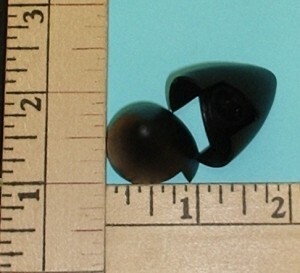 Size 2.5" (63mm) OD. Factory shaft hole in back plate is .252" (6.4mm). 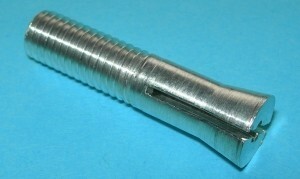 Overall Length is 2.465" (62.6mm). GF Nylon Spinners have light weight aluminum back plate. No special prop nut or adapter is required. 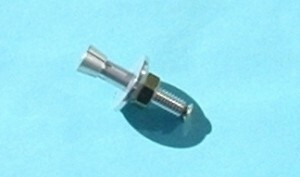 Spinner is held to back plate with two attachment screws. Machined groove supports edge of spinner. Back plate is knurled on both sides to grip both your prop and prop adapter making it easier to tighten than other spinners of this style. Size 2.75" (70mm) OD. Factory shaft hole in back plate is .315" (8mm). Overall Length is 2.755" (70mm). GF Nylon Spinners have light weight aluminum back plate. No special prop nut or adapter is required. Spinner is held to back plate with two attachment screws. Machined groove supports edge of spinner. Back plate is knurled on both sides to grip both your prop and prop adapter making it easier to tighten than other spinners of this style. Size 2.95" (75mm) OD. Factory shaft hole in back plate is .315" (8mm). Overall Length is 3" (76.2mm). Six Replacement rubber spinners for GWS Electric Power Systems. Press fits onto threaded end of gearbox (or prop adapter) with 3mm shaft size. Useful for smaller props like 7" and under usually. 6 per package. High quality precision anodized aluminum 51mm spinner-prop adapter combination. For 5.0mm(0.20") motor shaft.